Sleeping Underwater Giants is a track title that basically describes exactly how the actual music is sounding. Just think about the depth of a blue ocean and underwater giants doing a friendly nap. Lovely sleepy tones are creating a dreamy underwater track. Sasha Darko is an artist that keeps delivering what it is promising on the outside of the tin. The Seagulls & Whales song sounds exactly like a song either made for Seagulls and Whales or made by them, or both. Very enjoyable new age vibes with beautiful synth pads translating the voices of these magical wonders of nature, mixed with actual relaxing sounds of nature. With the next track Sasha Darko takes the listener 1500 meters below where the water is obviously a lot colder and darker, but where magical sea creatures amazes us with their beautiful shapes and colors. 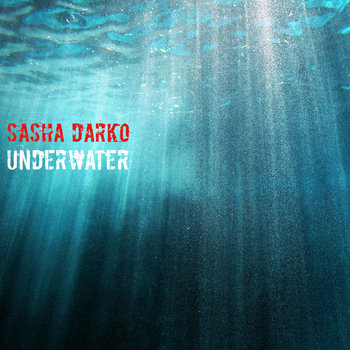 On this wonderful journey on the bottom of the sea, Sasha Darko guides us to a long lost sunken submarine. The music feels like a movie track highlighting the beauty of decay, the wondrous groups of fish that we encounter and the mystery that is behind this human created craft surrounded by a never ending weight of water. Still inside the submarine we enter a chamber with old machinery, the meters and knobs seems to be well conserved in this deep sea making it a interesting diving expedition, viewing these long lost treasures of our human history. When we dive back up we are greeted with the wonderful reflection of flocks of seagulls flying above the pretty sea. The sky is clear blue and the sunshine glitters on the surface. Magical wonders happen in the name of mother nature and what a pretty sight it delivers! This entry was posted in ambient, audio collage, chill out, electronic, experimental, soundscape and tagged abstract, ambient, chillout, downtempo, electronic, experimental, new age. Bookmark the permalink.